The Klimes family represent our idyllic view of the small family farm. 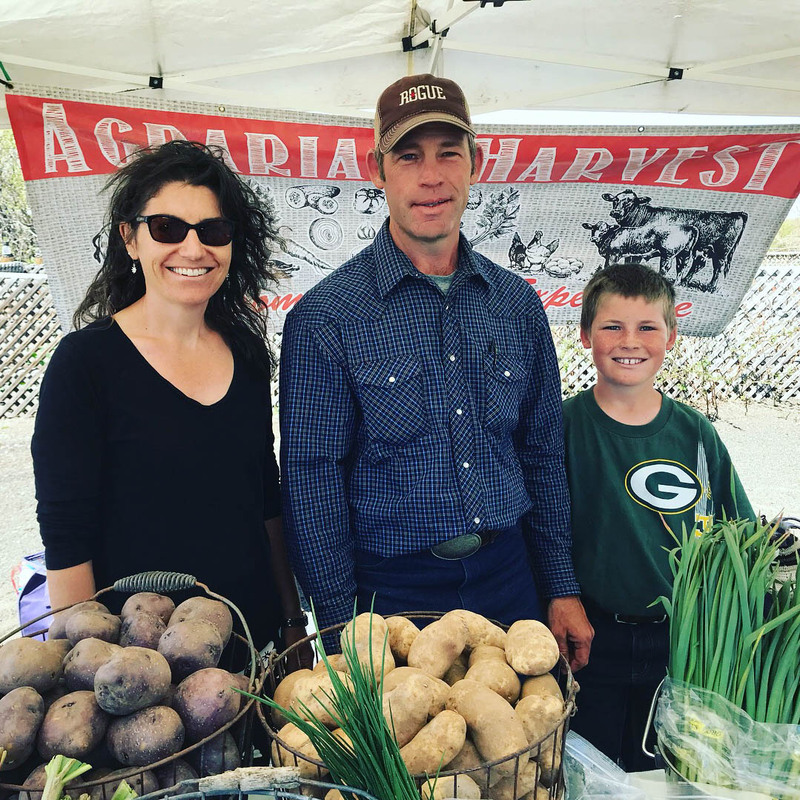 John and Becky come from South Central Idaho farming families, and together they have decided to raise their children on a diversified, organic family farm. The Klimes value soil health, regeneration, and diversification in the food system. Together, as a family, they bring locally grown, beyond organic food to our community, and for that, we are delighted to honor them as Local Food Heroes. Their farm, Agrarian Harvest, provides a diversified market garden product line including certified organic meat, poultry, fresh vegetables and herbs, and dried beans. What inspired you to start farming? We started market gardening after growing up on farms and taking a leave to go to college and pursue other careers as society teaches students. We always had gardens and raised a few chickens and beef cows along the way. The draw to grow food was strong and John felt very drawn to working with plants, soil and animals. Food for sale is actually a bi-product of our desire and a means of economics. Having our hands in the soil and working with animals is fluid with beginnings and endings. We love starting seedlings and having baby animals running around. We watch them grow and mature and become something. There is a sense of accomplishment when the harvest is on the table and we know where it came from. What role do your children play on the farm? Our children are involved on a daily basis, helping and learning. They help care for animals, plant seeds, harvest, taste test, and market. They are fully involved in the process and the business side of our operation. What are some of your favorite farm-fresh family meals to make on busy nights? We eat what we grow and, in the heat of the season, it is difficult to plan and prepare meals when we are putting in so many hours. Kale and lettuce salads along with other fresh vegetables are a staple along with our dinner sausages that are a quick fix in a pan or on the grill. What do you produce on your farm? Anything extra unique or fun to raise? We typically produce over 50 varieties of vegetables along with beef, pork, chicken, and eggs. Our vegetables include staples like potatoes and tomatoes and get as diverse as okra, flowers, and herbs. We also try new things every year like sweet potatoes which were not successful, and others like basil that have become a staple. We are becoming more interested in flowers, as they beautify the property and are a nice addition for our on-farm visitors. What have been some of your biggest challenges as farmers? Biggest successes? When you take a passion and try to turn it in to a business, huge challenges come with it. You start having to think about what you can grow that will pay the bills. This can crimp your style when you want to try more exotic things. Our biggest challenge has been getting it all done. While sitting at my computer in the winter I can farm the whole world, but reality checks in around June when harvest, weeding, and marketing collide. Growing is our passion, marketing is our challenge. We are not alone in this. One of the biggest struggles for small farms is marketing and logistics. Producing food is a full-time job without the marketing and transportation aspect. Another challenge to discuss another day is the pressure to get big. Success is a relative term. We have been able to produce a huge amount of food on a relatively small plot of land, we are together as a family on a daily basis, and our customers have been a great support group. Our passion has put food on our table as well as others and has paid the bills. Though not an extravagant life, it is rich with family and good food. There are a few local heroes that we look to for guidance including our parents (who are farmers) and Mike Heath. We also consider Joel Salatin, Elliot Coleman, and many others in the healthy land- healthy food movement as heroes. Our heroes have all been hard-working, thoughtful people. They come from different backgrounds, but they have a central theme of producing the best, caring for the land, and spending time with family. All of our heroes have made an honest living while caring for soil and people. People need to know where their food comes from. If you don’t know your farmer, you have no way of knowing what is in your food. It doesn’t matter what label is on it, you don’t know what is in it. From a food security standpoint, local food production is extremely important. Are you certified organic? Why have you chosen to go the organic route and what does it mean to you? We are certified organic. Certification is a small piece of information that gives consumers an idea of our production practices. It is not what some people think it is. Organic certification allows things that we don’t believe in. People who don’t come to our farm or meet us can use this label as an indicator of how our food is produced and some of our wholesale customers need it for their customers. We, on the other hand, are frustrated with the compromise that the National Certified Organic Program allows. What farming practices do you use on your farm that could be considered “beyond” organic? We do not use any pesticides, we use high diversity and intense crop rotation, we do not believe in hydroponic systems as a way to produce nutrient-rich food, and we use minimum tillage. We don’t actually consider what we do to be farming. Farming may give the customer the wrong impression about what we do. We are highly diversified market gardeners. When people think of farms, they think of mono-cultures as far as the eye can see and grain towers. Most farms produce feed, not food. We are a business that produces, markets, and distributes food. We don’t see the food system changing any time soon. People who want good quality, nutrient-dense food will have to find it. Farmers in the big picture tend to go to the government offices and find out what crops have the best subsidies. That is how they decide what to grow. We don’t plan on growing in size nor do we seek a government hand out. We grow food because it’s enjoyable and we can look in the mirror and not be ashamed. Local food is growing as people learn more about our predominant industrial system. My hope is that grocery stores and restaurants will focus more on sourcing local when possible and that they screen those local producers to make sure that they are not fraudulent. My challenge to consumers is to spend one day each year investigating where their food comes from and visit the producer in person.